In this episode we witness that Azra is really upset when she finds out that Shameer is in love with her best friend Mona. It’s really hard for azra to digest the whole situation the people she trusted the most, Two pillars of her life on which her whole world stands seems to be devastated. Sarah khan acted soo well in few scenes. We can relate the pain and her helplessness in the scene where she came to Mona house for the confrontation and specially the dialogues were on point where she say “her cheez tum say musaliq mehangi par jati hai” everything that associates with you turned expensive for me. they have been sharing several things since childhood but now she has a problem when it comes to her husband Shameer and she won’t compromise on that. The repentance of Mona and Shahmeer is evidence. But its very sad how Mona and Shahmeer is playing the child card against her. 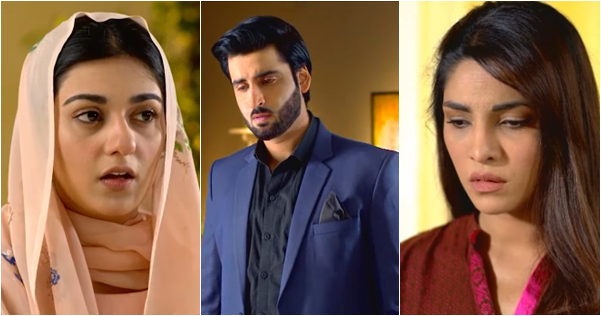 The way shugufta ejaz and her daughters exploits the whole situation its very heart wrenching at times it gets annoying why azra is not taking stand for her own. Azra is also seen praying and asks for forgiveness from her in-laws because she wants to conceive and make ultimately make Shameer happy and to save her married life. However she is still unaware of the fact that Shameer and Mona are already married. Let’s see which way the drama goes now. So far we are just in love with the flow of the drama.